The list of global brand names planning to list in Hong Kong is swelling, with Glencore International set to seek approval for its initial public offering on Thursday and Italian Ducati Motor Holding saying it is considering a listing in the city. Already waiting in the wings are Italian fashion house Prada and luggage maker Samsonite. One banker said he was in the very early stages of pitching a listing in Asia to a European sports club. Glencore is scheduled to meet with the Hong Kong stock exchange’s listing committee on Thursday to seek approval for its plans for an initial public offering, people familiar with the matter said. The Baar, Switzerland, commodities powerhouse has hired banks to pursue a dual listing in Hong Kong and London to raise as much as $10 billion. Meanwhile, Italian motorcycle maker Ducati said its private-equity owners are considering a listing in Hong Kong as one option to exit their investment, though a Ducati spokesman said the company had no concrete plans in place to list in Asia. 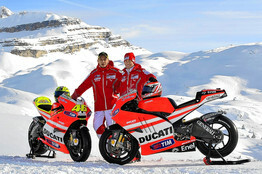 Ducati counts among its shareholders private-equity firms Investindustrial Holdings and BS Private Equity. Companies considering raising capital face choppy markets, roiled by concerns about political unrest in the Arab world, rising oil prices’ impact on global economic growth and the implications of Japan’s disaster. Still, bankers say that after an initial pullback following Japan’s recent disasters, many companies were comfortable pushing ahead. SBI Holdings, already listed in Tokyo, seeks to raise as much as US$328 million in an IPO before listing in Hong Kong on April 14, according to a term sheet, by selling shares in the form of Hong Kong depositary receipts, or HDRs. The financial-to-property conglomerate is set to be the only Japanese company listed in Hong Kong and just the second company after Brazil’s Vale to issue HDRs. Bankers say that to have a successful share offering in Hong Kong a company needs to have at least some operations on the ground in the region to persuade investors it can capitalize on the region’s economic growth. In 2009 Ducati opened its first store in Shanghai. More resources companies are likely to list in Hong Kong given China’s increasing demand for commodities to fuel its economic growth. Consumer brand-name companies also are keen both to sell to the expanding affluent masses in China and to tap the increasing amount of Chinese capital flowing across the border into Hong Kong, bankers said. Hong Kong was the world’s biggest IPO market last year, with US$57.7 billion raised from 87 listings. Another group of companies rumored to be looking at dual listings are cash-strapped and thinly traded English football clubs. Football has captured the hearts, minds and wallets of Asia. Hong Kong businessman Carson Yeung took control of Birmingham City in 2009 in a deal that valued the club at £81.5 million (US$130.5 million). It also was the most popular sport across nine Asian countries surveyed by TNS Sport in 2007, the most regularly practiced sport and the sport most regularly watched on TV. Of the respondents, 86% said they were interested in football at some level. Still, the extra cost and management time needed to maintain a listing may make the proposal prohibitive. More important, investors and the Hong Kong exchange may not be too keen. Costs at many clubs have outpaced income in recent years, largely because moguls and millionaires have been eager to splash vast sums on players and playgrounds, driving star players’ salaries skyward and eating away at team profits. This entry was posted in Finance, IPO. Bookmark the permalink.